Often, prospective ocean engineering majors will ask, "Will I be limiting my career opportunities by choosing Ocean Engineering over a more traditional or "conventional" major?" While this is a very valid concern and a very good question, the answer is very simple: Certainly not. All engineering majors here at USNA begin with a solid foundation of engineering fundamentals and include several traditional fundamentals of engineering courses such as statics, dynamics, strength of materials, materials science, thermodynamics, fluid mechanics, along with other applied engineering courses. The difference that ocean engineering brings to engineering education is that the application of the fundamentals learned can be so varied -- and so interesting! You will learn more if you are interested in the subject matter. So if the ocean or the coast interests you, and you are interested in applying math, science, and physics to design solutions to some of mankind's most challenging problems, Ocean Engineering may very well be the major for you! Some people tend to think of Ocean Engineering as a very "specialized" or "limited" engineering discipline. Unfortunately, nothing could be farther from the truth! Ocean Engineering regularly deals with concerns that many other engineering disciplines address, and many more that the others do not deal with! Take, for instance, the design of an underwater research vehicle. In its design, many conventional design issues, such as structural, electrical, hydrodynamic and propulsion concerns must be taken into consideration, but in addition to those, life support issues and robotics must also be incorporated into the design. Ocean Engineering encompasses engineering for oceanic and coastal problems -- which often incorporate issues not seen in any other engineering discipline. Within and Outside the Navy/Marine Corps -- The Opportunities Are Limitless! We have many interesting alumni, including an alumna from the class of 1981: CDR Wendy Lawrence, a helicopter pilot who could land on a battleship but not stay overnight (!) 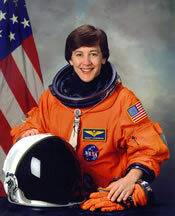 ... she went on to graduate school at Woods Hole and eventually became a NASA Shuttle astronaut. Other more recent alumni of note have included Cara Grupe and Mary Godfrey, each graduated #1 in her respective class. Even more recent classes have seen 4.0 CQPR, varsity-athlete students who have vied for the #1-spot upon graduation. In graduate school and in commercial industry, a solid engineering education is what counts. The Naval Academy's Ocean Engineering program is ABET-accredited and is highly regarded by other academic institutions as well as in the commercial sector. Therefore, our graduates have been accepted to and have graduated from top graduate schools such as MIT, UC Berkeley and others, and have acquired positions within a broad spectrum of private companies and government organizations -- in areas within as well as outside of Ocean Engineering. If you are still concerned about potentially limiting yourself by your engineering field selection -- be it OE or some other -- just remember that a solid engineering education is what counts, and all USNA engineering majors are fully accredited because they provide that solid foundation. Many engineers pursue successful careers outside of the exact discipline in which they received their B.S. degree. So, pursue a degree where your interests lie -- that is where you will be happiest and most productive.